Bureaucracy, red-tape and forms filled out in triplicate: not things most people think of when they think of beautiful documents. But in reality, almost as soon as humans invented writing, we started using it to record legal agreements between people. 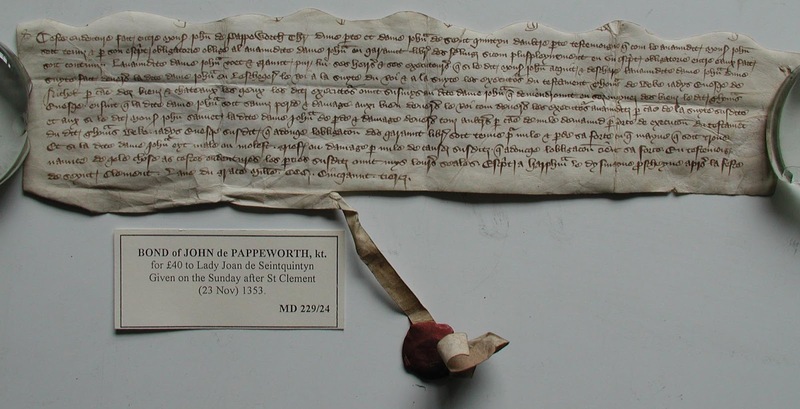 Medieval contracts are just as verbose as our modern day legalese. 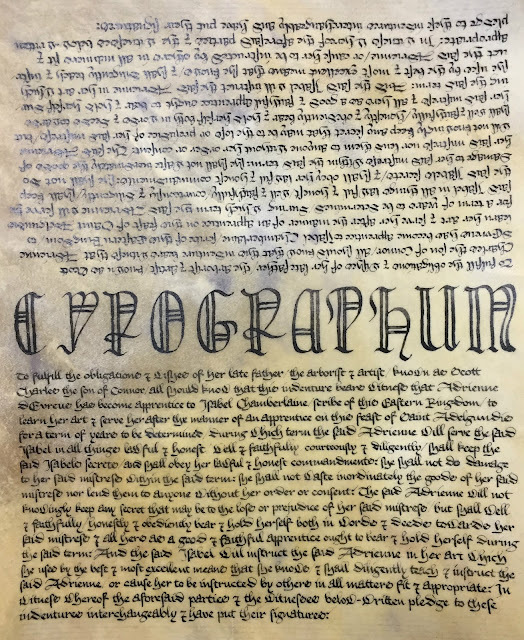 But in those days before carbon paper and ball point pens, they had a much more artistic way of handling the need for each party to a contract walking away with a copy: the Indentured Chirograph. Before I get into discussing the making of this document and sharing pretty pictures, I'm going to start with some lessons on the history of this type of document and apprenticeship within SCA culture. What is a Chirograph or Indenture? 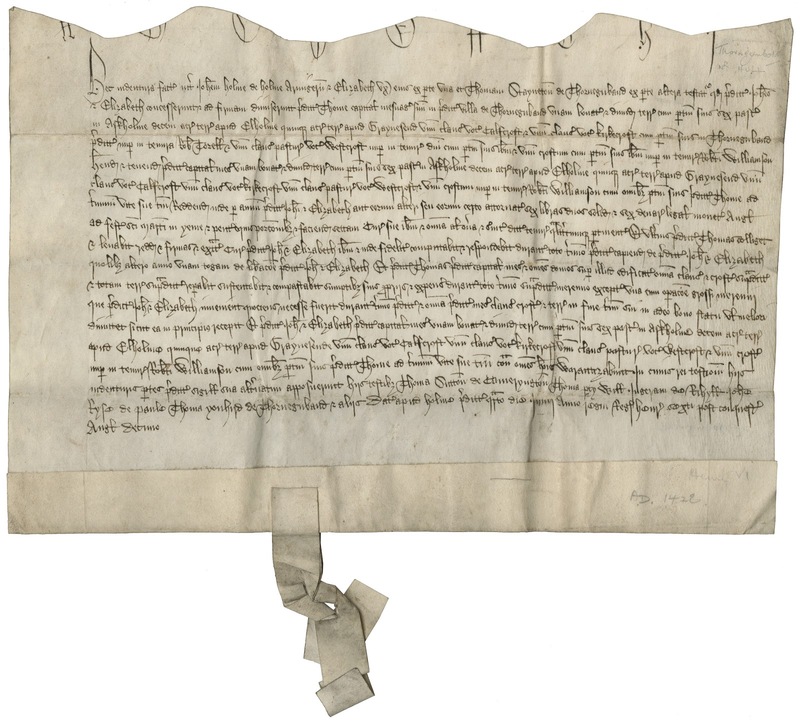 A chirograph is a medieval document, which has been written in duplicate, triplicate or very occasionally quadruplicate on a single piece of parchment, where the Latin word "chirographum" (or equivalent) has been written across the middle, and then cut through. By this means both parties to an agreement could possess a copy of its written record, and each copy could be verified as genuine through introduction to, and comparison with, the other. The cut itself would often be made to produce a wavy or serrated edge, to reduce the possibility of forgery. This practice gave rise to the document description "indenture", since these edges would be said to be "indented". 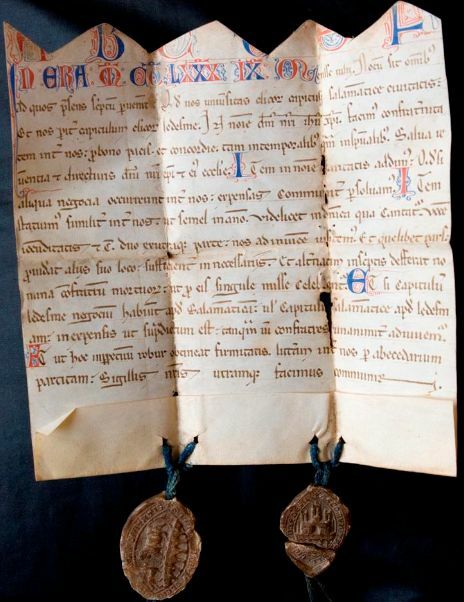 The earliest surviving portion of a chirograph in England dates from the middle of the ninth century. In period, a master taking on an apprentice was a business arrangement. The apprentice learned a valuable trade skill, while the master got an indentured servant to help them with their work. The apprentice or their family often paid for this privilege as well. Contracts were fairly common detailing exactly what was expected and required of both parties. In the SCA, apprenticeship is used to describe a "formal" relationship between a student and their Laurel. 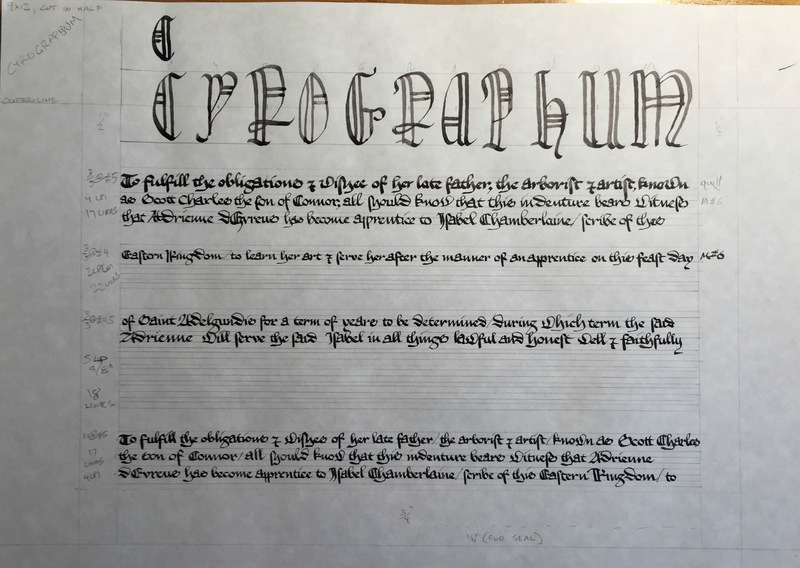 Crispin Sexi has put together a wonderful page that talks about the SCA culture of apprenticeships and has some examples of the language used in real period apprenticeship contracts. One thing to note is that some apprenticeships are very informal, while others are fairly well negotiated and documented. Toward the end of 2015, Isabel and Adrienne came to the mutual agreement that Adrienne would enter into a formal apprenticeship at the Market Day at Birka event held in January. Isabel asked if I would be willing to write up the contract for them. I of course said yes, wanting to make something special for my lady. To fulfill the obligations and wishes of her late father, the arborist and artist, known as Scott Charles the son of Connor, all should know that this indenture bears witness that Andrienne d’Evreus has become apprentice to Isabel Chamberlaine, scribe of this Eastern Kingdom, to learn her art and serve her after the manner of an apprentice on this feast of Saint Adelgundis for a term of years to be determined, during which term the said Adrienne will serve the said Isabel in all things lawful and honest, well and faithfully, courteously and diligently, shall keep the said Isabel’s secrets, and shall obey her lawful and honest commandments; she shall not do damage to her said mistress within the said term; she shall not waste inordinately the goods of her said mistress nor lend them to anyone without her order or consent. The said Adrienne will not knowingly keep any secret that may be to the loss or prejudice of her said mistress, but shall well and faithfully, honestly and obediently bear and hold herself both in words and deeds towards her said mistress and all hers as a good and faithful apprentice ought to bear and hold herself during the said term. And the said Isabel will instruct the said Adrienne in her art which she uses by the best and most excellent means that she knows, and shall diligently teach and instruct the said Adrienne, or cause her to be instructed by others in all matters fit and appropriate. 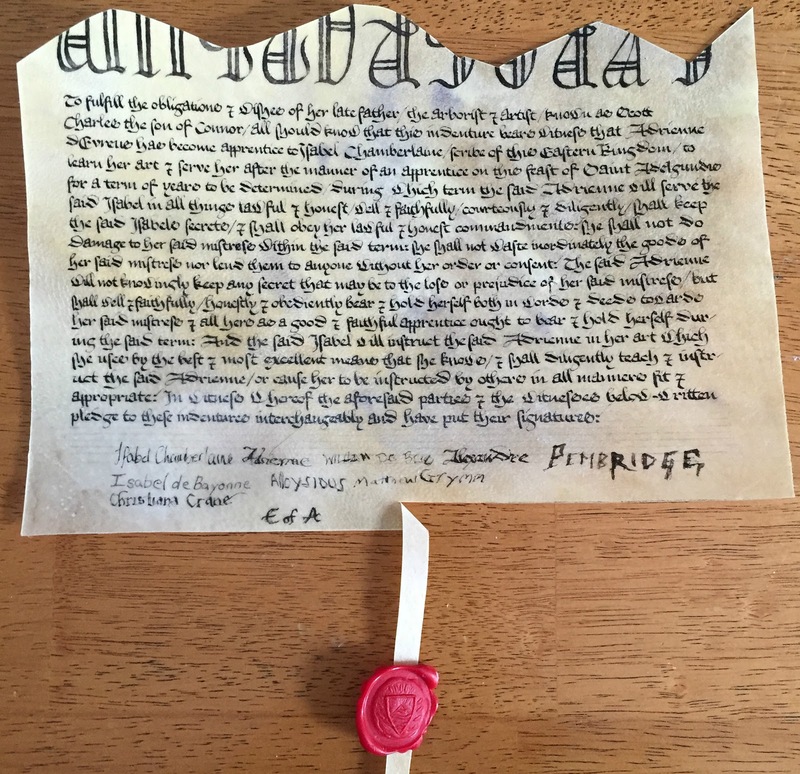 In witness whereof the aforesaid parties and the witnesses below-written pledge to these indentures interchangeably and have put their signatures. While the wording was being written, I researched example documents to use as a basis for mine. 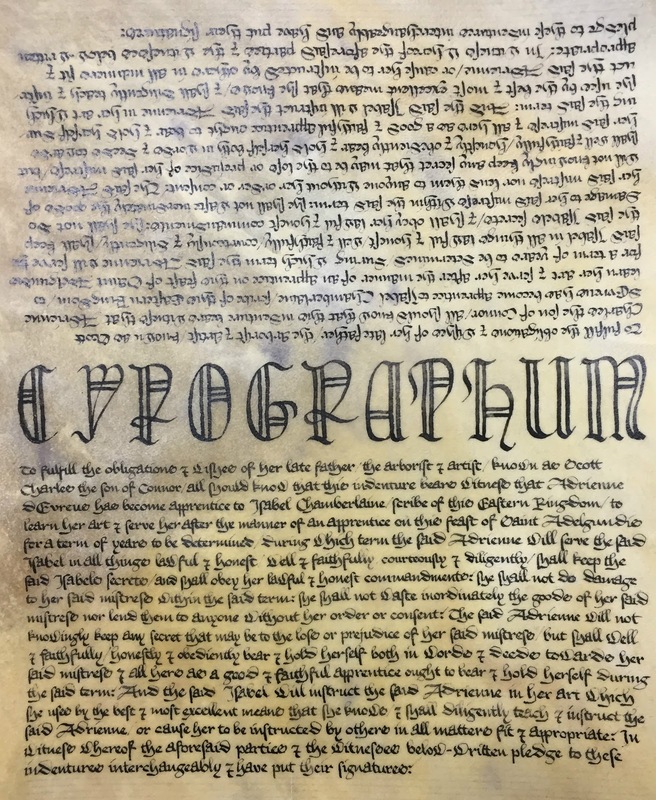 One common feature of these contracts was that the word Chirograph or Cyrographum was penned in large, decorative letters in the border between copies of the text. After the contract was signed & sealed, this word was cut through in a random toothed pattern. This made it more difficult to forge a replacement contract-half with new words, as matching the uneven cut and fancy lettering would be extremely difficult. With words and inspiration in hand, it was time to start practicing. I knew I was going to use a piece of 9x12 parchment. With two copies of the text, I had a lot to fit in a fairly small space. I planned smaller borders than is usual for SCA scrolls: half an inch on the sides, and three-quarters of an inch on the bottom. The bottom space needed to be large enough for signatures, and to cut a strip for Isabel's wax seal to attach to. I determined the size by practicing 2-3 lines of text with different line spacing and nib sizes. For each test, I adjusted the text in my word processor so the line-breaks matched my practice. Then I counted how many lines of text I would have, and calculated how much vertical space that would take from that AMES guide setting. I ended up using the 1:1 scale on the AMES guide at a setting of #5, with a Mitchell #6 nib. 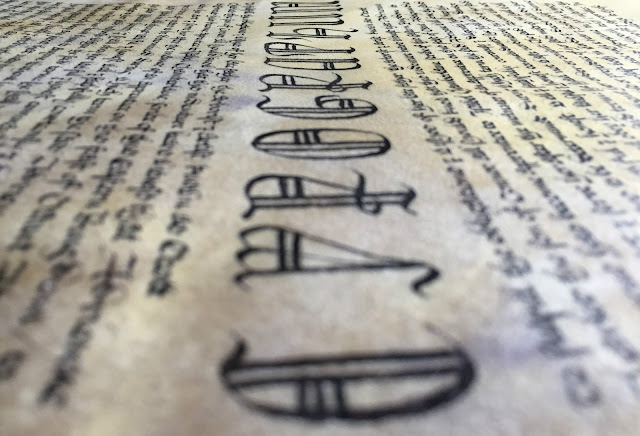 With the size determined, I prepared and lined my parchment. For this piece, the hair side had such wonderful coloring I chose to use it instead of the whiter and smoother flesh side. 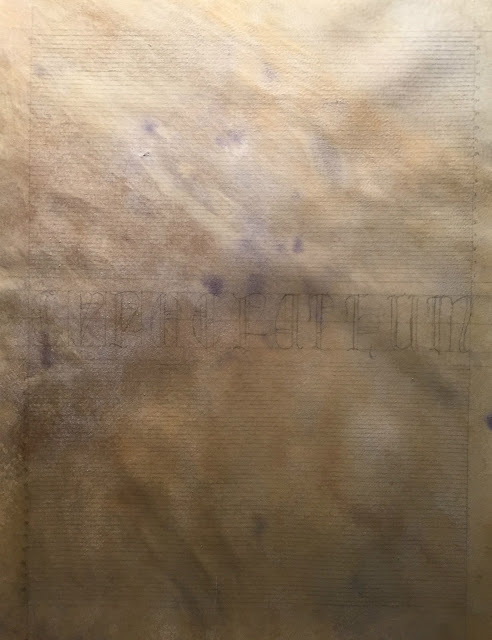 I should have sanded and prepared the parchment a little bit more, as getting the ink to flow consistently was difficult as the surface was a bit too textured. In order to ensure that the spacing of the word CYROGRAPHUM was nice and even, I measured the spacing and penciled the letter outlines in before starting. Several hours of work later, the text was finished. After the ink dried, I erased the pencil lines. A few weeks later at Birka, Isabel added her seal to the bottom of each half the document. 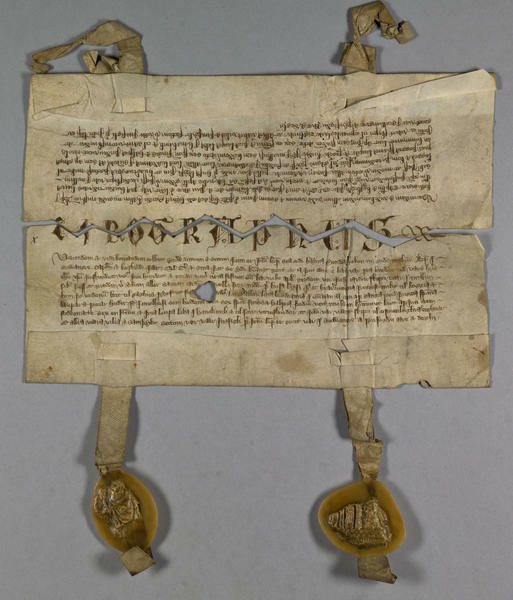 Then they held a ceremony where witnesses signed both halves of the document, it was read aloud, and then Isabel proceeded to cut all my hard work in half! Adrienne's half is now safe at home. If you'd like to see more of the ceremony or read more about apprenticeship, both Adrienne and Isabel wrote blog posts about it.